Arai Defiant Chopper & Chronus Graphics: Get To Da Choppa! 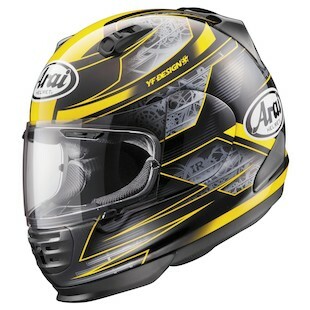 Arai prides themselves on tradition and heritage. They’ve found what works, and don’t enjoy straying too far from their comfort zone. The Defiant helmet is Arai’s successful attempt at thinking outside of the box. The Defiant was developed with the urban / café racer motorcyclist in mind. New for 2014, Arai continues to think outside of the box with graphics that are bound to impress. 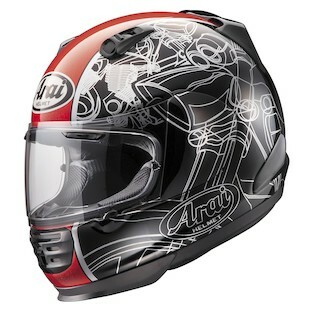 The Arai Defiant Chopper graphic is a mixed breed, appealing to multiple riding segments. From Harleys to Café Racers, the Chopper graphic should fit the build. It has your classic American pinstriping on the sides with a Euro-styled single red racing stripe down the center. The Arai Defiant Chronus graphic looks like the Star Trek Enterprise at top warp speed. Don’t be surprised if you get the occasional, “Slow down, this is a neighborhood!” from Mr. Wilson next door. The Chronus comes in Black, Yellow, Red, and Green warp speed options. The Chopper and Chronus graphics are consistent with the Defiant’s purpose in life. They are unique. They are non-typical. These two graphics solidify Arai’s message of thinking outside of the box.